We all do it, buy clothes for our husbands, in the style we wish they were, instead of how they are. Thank God for this, or we would have a bunch of men running around in gym shorts and sports jerseys. I have officially stopped buying clothes for my husband. Ninety-nine percent of the time when I come home with something for him, it is returned for a plaid shirt of some kind. My husband has the short sleeve version, the sporty version, the going out version, and the flannel version, all of which he owns in a variety of colors. Fortunately time is measured by the change of seasons, not the change of clothes. I guarantee I wouldn't know how old I am if I had to use my husband's weekend "uniform" as the gauge. Yesterday I spent the afternoon with a wonderful couple and their three kids. 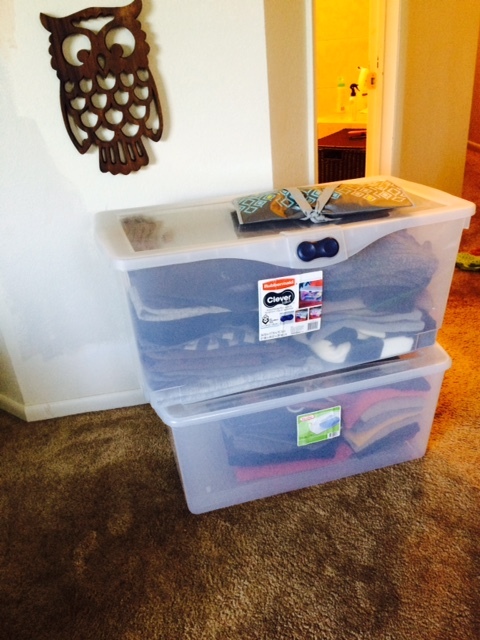 Lindsey hired me to help her husband go through his clothes and organize what he wears. She felt like he was lost when getting dressed, whether for work or going out. I present to you the donation pile. 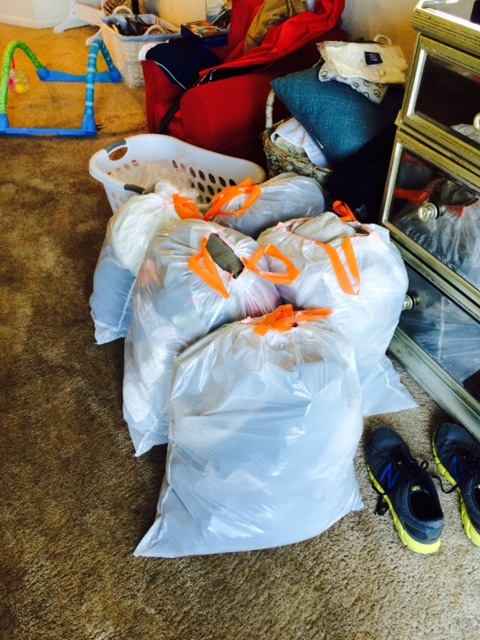 In these bags are clothes that have never been worn, AC/DC t-shirts from the late 80's, pants so wide Lindsey and her husband could have fit in them together. When your closet gets to the point that you have more swimsuits than shorts, you never have to wear the same pair of jeans twice in a month, and you can't see what you own, something has to give. Thankfully, we created five bags for donation, two bins of seasonally inappropriate clothes, and recycled about one hundred dry-cleaning hangers. Our day was officially done! My suggestion to women of the world, stop buying things for your husband because you think they need it. I promise when they are down to their last dress shirt and all the buttons have fallen off their pants, with replacements no where in sight, they will let you know they need more clothes. At that point you can go crazy, have a heyday. Until that happens, spend the money on yourself! My name is Stephanie and as far as I am concerned there is never enough time to shop, especially when looking for a good deal. I founded Gelty because I am obsessed with amazing fashion finds at even better prices. I can help you update your look with all of your favorite brands at a discounted price. You deserve to look and feel amazing without all of the Gelt that comes along with paying full price. Want to know how I can help you? Click on the Services Offered tab for more details. If you like what you see, click on the Contact Info tab and let's have some fun! I'm not overall it, yet. Mother's Day or Father's Day, you choose. Picture Window theme. Theme images by Maica. Powered by Blogger.